We believe everyone should have a warm, safe home and we’re supporting this year’s Housing Day which is on November 12th, 2014. It’s a day which has been set up to celebrate the positive impact of social housing on thousands of people across the UK. There’s various platforms for people to share their stories about where they grew up and what home means to them. Housing Day is set up for everyone across the country to get involved, whether you’re a tenant, landlord or anyone with an interest in social housing. Last year’s Housing Day proved a great success with over 1,000 tweets an hour and this year’s day looks set to surpass that. So get involved, follow the day and share your stories, pictures and videos on Twitter and Facebook tagged with #HousingDay on November 12th. Inside Housing backed the first Housing Day event in 2013 which reached thousands of people in the sector and trended on Twitter. How do you top that? Well the founder, Ade Capon, has plenty of ideas. While Housing Day 2013 was a success in scale, Mr Capon said he would love to be get more tenants involved in this year’s offering. Mr Capon is hoping to reach a wider audience this year in order to challenge the negative perceptions of social housing tenants. One key idea he has for doing this is catching the attention of TV production companies with the stories shared by tenants during Housing Day 2014. Mr Capon is urging housing staff to get creative with their involvement – whether it’s a selfie, a video, an infographic or whatever clever ways you can think of to share your stories about what working in housing is actually like. Also, he said being authentic and genuine are key to reaching a wide audience and encouraged staff to get directly involved rather than leaving it up to their communication team. Mr Capon says that the sector creates a lot of noise internally but people who don’t work in it often pull a blank face when the topic of social housing comes up (as Inside Housing staff are well aware). He wants to work collaboratively to produce research about the public’s perception of social housing and tenants. He is keen to speak to anyone interested in taking this on/working with him to help get this off the ground. Mr Capon argues that at present there isn’t a housing brand. Instead there are a lot of individual businesses, bodies and movements, but no collective voice. In the run up to the 2015 election, where housing is playing a more central role for voters than ever before, he thinks now is the time for unity across the housing sector. He’d like to create a coalition of housing groups to make so much noise that it’s impossible for politicians to ignore. 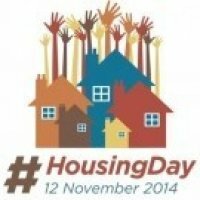 Housing Day 2014 will be held on 12 November. Get involved using #HousingDay across social media and find more information at @HousingDay or @AdeCapon.